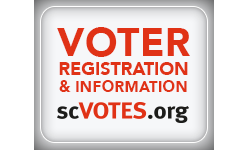 HCDP has collected this helpful information for those interested in becoming a Democratic candidate in Horry County. In 2015, the South Carolina Democratic Party launched this program to develop the next generation of leadership and talent in our Party. Over the course of a year, dozens of Fellows meet for five intensive three-day training sessions. Participants learn to manage political campaigns, run for office, and assume party leadership roles. If Democrats and progressives are to make gains in the South – an integrated, multi-faceted approach is needed to revitalize and grow the Party in this region. South Forward helps with “building the bench” by offering direct support to candidates in down-ballot races, especially municipal and state legislative races. Title 7 of the SC Code of Laws pertains to elections within South Carolina. It describes the laws regarding how to become a candidate, election rules, filing requirements, and other related details. The SC State Ethics Commission is the agency that enforces state ethics laws. Their website provides public officials, public employees, political parties, and campaigns with information to ensure compliance regarding conduct, financial, campaign, and lobbying disclosure rules. If you wish to learn more about becoming a Democratic candidate in Horry County, please Contact Us.